Is china called china because it’s from China? Leave a Comment on Is china called china because it’s from China? My point is, when I found out that, as part of a celebration to mark Frederick the Great of Prussia’s 300th birthday (posthumously, I might add), the Museen Dahlem is exhibiting his collection of Chinese Porcelain pieces, I was a bit… ambivalent. I can’t even bring myself to hate the idea, that’s how little I care about Chinese porcelain, or indeed porcelain in general. Maybe it’s because I lived through the odd phase of chinoiserie in the late nineties, but to me the Sino-Japanese motifs are very passé, and personally I can’t deal with ornaments cluttering up the place, so an invitation to see a room full of these tea sets and dinner services is just…. not my cup of tea. Don’t get me wrong, any receptacle designed to hold tea is good in my books, but this is for purely functional reasons. And Chinese porcelain is beautifully and intricately decorated, and I admire the skilled artistry and craftsmanship that goes into each piece, but at the end of the day it’s just a vase or a plate. I’m obviously no expert, but to the average person’s naked eye, who would really be able to tell the difference between a priceless antique and a cheap department store imitation? Dear old Freddie, however, was a man of much more refined tastes, and even received a tea set personalised with his own coat of arms, which he housed in his own little ‘Chinese House’ where he probably hosted tea-drinking parties. Forget all the ceremony and pomp, I say lets break these cups and saucers out of their protective cabinets, and celebrate Frederick’s birthday the way he would have wanted – with a nice cuppa. If you promise not to touch, you can go down to the ‘China and Prussia. Porcelain and Tea’ exhibition at the Museen Dahlem in Berlin (until 31 December 2012), to see these pieces with your own eyes. 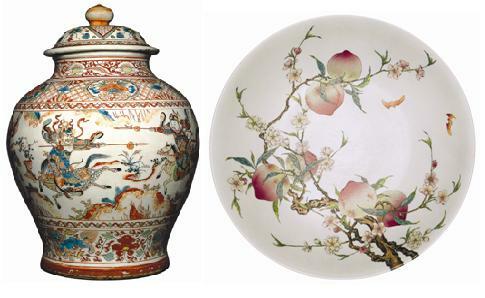 There is also an exhibition on Chinese porcelain that actually used to be eaten off, at the musée du quai Branly until 30 September. If you can’t promise, maybe it would be better to get a book on Chinese Porcelain, which you can touch as much as you like (available in print or as an ebook).